The course for the Whitsuntide Reliability Trial was selected "so that particulars thereof could be sent to each individual member of the Club and it was as follows- Carlisle-Stirling-Perth-Forfar-Brechin-Lawrencekirk-Stonehaven-Aberdeen, return was Aberdeen-Stonehaven-Dundee-Perth-Edinburgh-Carlisle, in all 476 miles". On 5-6-1912 the Committee decided that in order to find a winner from the five riders who had tied for first place in the last reliability trial (it is not Whitsuntide yet), the decider to be used would be by their performance in the next Club event! continued their Father's business in producing Matchless motorcycles). "During the year our Club and our beautiful and sporting County had been brought prominently before the world by the performances set up by Mr F. Smith, C.R. Collier, H. Gibson, V. Taylor and others in climbing Honister Pass with side-cars or solo machines and was much talked about in the motoring press. These events were organised by Club Members". We are also recorded as being involved in the A.C.U. One Day Trial which passed through our area during the year. For the 1913 "Scotch Tour" it was decided to apply a handicap system and Mr Kelly on his 1907 3.1/2 hp. 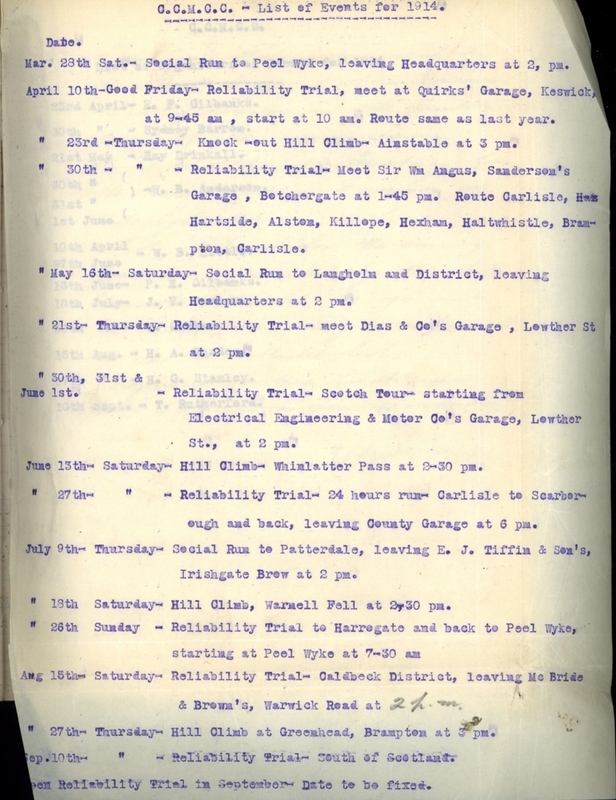 the forthcoming Six Days Trial, and one was selected from a choice of six , forwarded from Messrs J. Wheatley and Sons for consideration. First Team- T.B. Westmorland 3.1/2hp. Premier, R. Drinkall 4.1/2hp.Quadrant, W.B. Little 3.1/2hp. Premier. Second Team- T. Rutherford 7.9hp. Matchless S/car, J. Robinson 2.3/4hp. N.U.T, J. Watson 2.3/4hp. N.U.T. The Great Britain Team, entered by the A.C.U., was W.B. Gibb 2.3/4hp. Douglas, W.B. Little 3.1/2hp. Premier and C.R. Collier 8hp.twin Matchless S/car. It is reported by the Carlisle Journal that after the second day's running, "the competitors were so indignant at the dangerous nature of the course that they held a meeting to discuss the matter in the Great Central Hotel. About 150 riders were present." The organising committee allowed an extra running time of 15 mins. for solo's and 20 mins. for side-cars for the day, but refused to alter the routes and conditions. instructions and permission to retire. The riders are unanimous in their condemnation of the use of impossible tracks in the itinary"
The Cumberland County M.C.C. First Team finished second in the private Club Team Prize. 1913 had been an eventful year with the First International Touring Trial, (now I.S.D.T.). and 57 entered for the Warnell Hill Climb. On 6th December 1913, Mrs Grant, wife of well-known jeweller Norman, presented a Trophy for the winner of the Lightweight Class in the Scotch Trial, to add to the other perpetual Challenge cups donated by CW Lowther, EA Iredale, Hilton Robinson, The County Garage, Sir Angus Sanderson and The Triumph Motor Co. Sadly the Norman Grant is the only one still existing in the Club Collection. It was decided to purchase silver shields for the plinths of these perpetual trophies, presumably from Norman Grant and Son! It was resolved to create a Novice Class in the main events, being defined as a member who has never previously won a prize as a motorcyclist. Efforts were made to create a Western Section of the Club, meeting at The Commercial Hotel, Whitehaven, and adopting the present Rules and Constitution with two members from each section being on the other Committee, and the Fixture List for 1914 was confirmed. The Penrith and District Motor Club requested details of our events. Vice-Presidents for 1914 included Sir Ben Scott, FW Chance, The Dean of Carlisle, IW Raymond (London) and Carlisle Chief Constable. Our Good Friday Event was to be run with the following marks deducted for "stops". "Ordinary" stop-10; Transmission or Tyre stop-15; Mechanical stop-20; For Adjustments in Controls-10. An Allowance of 20 marks (for passenger machines under 600cc. and single-geared machines) as bonus marks will be made. April, 1914. The Western Section had 30 Members. and this may be the first of many motorcycle victories recorded in the name of WT Tiffen, both Senior and Junior. these included stopping in a non-stop area between Crieff and Kenmore, tyre trouble between Crianlarich and Rest and be Thankfull, stopping within sight of the control at Dunoon, taking wrong course between Dumfries and Carlisle, and filling-up with water between Dumfries and Carlisle. Some protests were upheld, some were rejected and some were referred to the A.C.U. Lightweight Class. 1-PN Gilbanks 208. 2- D Leach 228. Solo Class. 1-R Drinkall 5. 2-WB Anderson 37. 3-EF Gilbanks 65. Passenger Class. 1-JW Moffat 28. 2-JF Fisher 36. 3-J Elliot 52. Novice Class. 1-JF Fisher 36. 2-D Leach 228. Lightweight Class. 1-GS Rutherford 0. 2-AJ Buck 15. 3-T Stordy 50. Passenger Class. 1-T Rutherford 0. Novice Class. 1-AJ Buck 15. 2-F Anderson 16. 3-T Stordy 50.